So the Lunar Chronicles is a series by Marissa Meyer. Currently the First three books are out: Cinder, Scarlet and Cress. Two more books, Winter and Fairest are to join the series in the years to come. Meyer has taken the old classic fairy tales and spun them into a new rich world. I saw Cinder several times in a book store and never picked it up until friends of mine mentioned how much they loved it (they may have even given me my copy? I can't exactly remember). 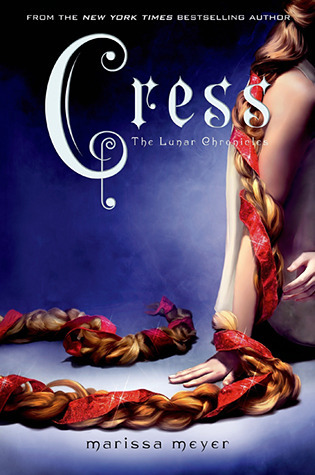 But I recently bought Cress to read and so I needed to brush up on the storyline and characters in order to get the full experience. My mom is also a huge fan of the books and is super mad at me for getting her interested in them before the entire series is out (she likes to binge read them all at once!) Since I read all three recently I thought that I would make one master post with mini reviews of each book, so that they will all be in one place. But just a warning- there may be spoilers in the reviews! So only scroll down if you have read the book I am writing about. First off I am insanely jealous of Cinder because she is so tech savvy. Sometimes its amazing that I have managed to turn my computer on at all! Cinder is pretty unique in that it is set in an Asian country (the Eastern Commonwealth) which in my reading experience is a rare thing. 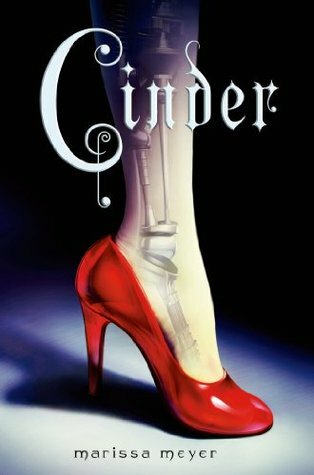 I loved the complexity and development of the characters, Cinder is so relatable and I can understand where she is coming from- even though I am not a cyborg living in a plague ridden world. It breaks my heart every time I read this book when I see the horrible treatment of Cinder, by the other people and even by her own family. With the exception of Peony and her 'faulty' android Iko, Cinder has no one. And her step mother is all sorts of creepy, mean, evilness. She is bad enough but then Cinder also has to deal with Levana who is that sort of evil characters (like Umbridge) who just gives you the heeby jeebies. She is one of those villains who just makes you want to scream WHY?! because they are evil simply because they can be. Just thinking about her makes me shiver. The plot is so intricate and I absolutely loved finding out how things connect later on and just bouncing in my chair yelling when I figured out how A relates to B. That is probably one of my favourite things to do and this book (and series) made me do it! Another aspect that I loved of Cinder and her world is the mix of science/technology and magic. Even the magic can be explained through some science. There is not nearly enough science in YA books and so Cinder made me cheer with its science. But it's not dry science- it's the sort of science where you think- oh I see how that might work (Especially coming from me- even though I'm not a bio kind of girl). It reminds me of that Thor quote "Your ancestors called it magic, you call it science". How the Lunars manipulate bioelectric energy would be considered magic in our world but to Cinder and the people of her Earth it is science but still has a mystical edge to it. So basically this book is incredible and I was super sad when it ended and I had to wait for Scarlet. It will definitely be on my list of books to re-read! I mentioned in my Cinder thoughts that I loved when the story unfolded and you discovered how people, places etc. where connected. And Scarlet upped the level even more than Cinder. YIPPEE since I love this! It's obvious in Scarlet that Meyer had a plan when she wrote these books because there are too many connections for her to have just randomly decided to do it. I look forward to finding out what else is a part of the tangly interconnected spider web. 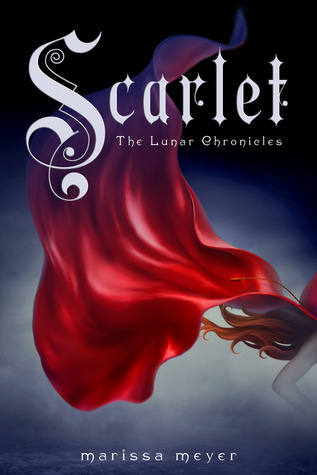 I don't want to say too much about Scarlet (the book) because I feel like I might accidentally give off major Cinder or Scarlet spoilers. Let's just say that a new host of very attractive (and somewhat scary) characters are introduced (*cough* Thorne and Wolf *cough*). The stakes are higher than ever (Levana is pretty much the evil queen/wishes to be overlord of the entire universe) and the story draws you in even deeper. The characters are developed more, the story is fast paced but mysterious and engaging. Really just loved this book too. I haven't read too many books with multiple POV so it was interesting to see how Meyer pulled it off in both Scarlet and Cress. At times did feel like I wanted to know what had become of a certain character/group RIGHT NOW but part of the magic of storytelling is having to wait to discover what happens- that moment of silence after a dramatic event where every reader is silently screaming WHAT?!?!. That is the best moment. Their best hope lies with Cress, a girl imprisoned on a satellite since childhood who's only ever had her netscreens as company. Cress picks up where Scarlet left off which was essentially a very crazy chaotic situation. There were even more POV written in (see previous complaint about this) but overall I thought it was handled well. It brings together even more of the loose ends throughout the story but at the same time leaves the reader with even more questions. Cress was definitely the book that made me want to throw it across the room most because my poor babies have to go through so much. Why can't they just be allowed to live happily ever after?!? Thorne anyone?!? THORNE!!! And Winter??? (she's nuts but just ahhhh). But it was also a bit frustrating to see the characters because they don't really have the best brains in their heads. Seriously, I'm not much older than some of them, and I'm not really trained in espionage or taking down evil dictators but even I knew that there plan was a little bit stupid. (It was. And it's a good thing someone told them). So if I had to sum it all up in one sentence I would say- Fantastic, incredible, amazing! GO BUY THEM NOW!